Think In Pink! Our cookie gifts feature 20 fresh baked pink sugar cookies in a regular gift tin. Cookies are fresh baked and shipped in the same day! Gourmet cookies make great holiday gifts, business thank you gifts and are perfect for birthday or company anniversary programs. Add your full color design or company logo. Fulfillment programs are available including company store and timely release programs. 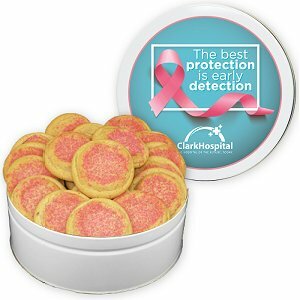 Minimum Order Imprinted: 24 gift tin Lids Run Charges will apply. - $3.00 per lid run fee for 1-4 colors.